Watch a short video about where and when the ancient Olympics began. Follow the action of the latest Games at the official Olympic Channel. See photos of the latest Games or scroll down for galleries of previous Olympic and Winter Games. Take a look back at some of the Olympic Games' opening ceremonies including London's 2012 Games. Which Olympic sport are you suited to? Find out with a quick quiz. Official website of the Paralympics, an Olympic-style event for disabled athletes. An A to Z guide to sports at the Paralympic Games. Browse Olympic mascots since 1968. Visit the Olympics Museum website. Search for results at past Olympic Games by Games, sports and events. When did the Olympic Games begin? Who are the greatest athletes? With 100 stickers of athletes such as Usain Bolt and Jessica Ennis-Hill, and photos and illustrations telling the story of the biggest multi-sport event in the world. The perfect activity book for the Olympic Games, produced in association with the International Olympic Committee. 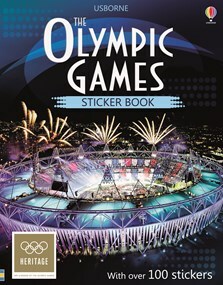 Packed with facts, stickers and activities, The Olympic Games Sticker Book is the perfect way to get ready for the Games… and have fun while you learn. If it’s indoor fun you need, learn about the history of the Olympic Games with the Olympic Games Sticker Book. Tells the story of the biggest sporting event in history. The book is great for children to enjoy before the Olympics start, as well as through the various sporting events that will be taking place during the weeks ahead. Covers everything from how the Games began to the opening and closing ceremonies, as well as information on all the major events. There are also more than 100 stickers of famous athletes including medal hopefuls Jessica Ennis-Hill and Usain Bolt. Published with the backing of the International Olympic Committee, this info-packed title will make a great companion for any Games-mad fan.